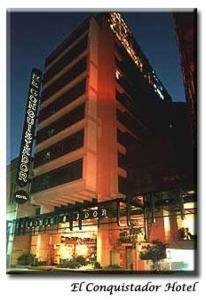 El Conquistador Hotel, Buenos Aires discount hotels and accommodation. The Conquistador Hotel, four star rated hotel, is situated in the center of Buenos Aires City, just a few meters from 9 of July Avenue and Santa Fe Avenue. No matter what your interests are: business, shopping, theatres, restaurants, park all of them are at walking distance from the Hotel.The Hotel offers 110 comfortable executive rooms and 23 suites (two atmospheres) decorated with a classic and distinguish European style. We remind you that, The Conquistador Hotel is always thinking on your needs in order to satisfy them. View photos, room descriptions and make online reservations at El Conquistador Hotel. Save on room prices at El Conquistador Hotel, Buenos Aires.